A lifetime of dissatisfaction with Evangelicalism leads a contrarian Christian intellectual to the Catholic faith in this spiritually focused memoir. Williams (The Moral Premise: Harnessing Virtue and Vice for Box Office Success, 2006) grew up in Michigan in the 1950s and ’60s as a Free Methodist, a formal denomination of Evangelicalism practiced rigidly by his abusive mother in an effort to avoid the world’s evils, from communism to Catholicism. But like his grandmother, who had adventured in India as a missionary, young Stan had a restless spirit, one that became more dogged in defiance of his mother and was bolstered further through his college studies in Christian existentialism, physics, and philosophy. Sampling numerous conflicting doctrines in churches and parachurches across the country, he remained spiritually unsettled by each denomination’s cherry-picking from the Bible, lack of unwavering moral doctrine, and an unwillingness to embrace the more charismatic and artistic aspects of worship. His evangelical faith exhausted, he skeptically, and without the support of his family, turned to Catholicism, using his own version of the scientific method (rooted perhaps too heavily in biblical anecdotes for some) to test and eventually embrace the religion his mother once vilified. Williams’ heavily conservative memoir, often overtaken by a tangible excitement, forgoes linear narrative and charmingly backtracks at times as if the momentum of the story has gotten ahead of the storyteller. The author uses lists to help organize the large amount of interdenominational information and employs a wry sense of humor and regular, comical hyperbole (“My teeth began to grind. Layers of enamel fell from my mouth into my open bible’s binding”) to keep things from becoming too dry. Williams has an impressively varied work history—training astronauts, photographing automobiles, and filmmaking. The heavy focus on Evangelicalism’s shortcomings, however, often obscures his other interests. 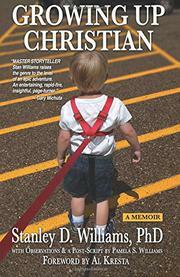 Friends, co-workers, even the author’s three children are largely regulated to background roles, unless needed to provide a revelation or a barricade on his journey to Catholicism. A modern apologetic that exuberantly uses the flourishes of memoir.